Book Expo America, a huge publishing event, is happening in New York this week. Many of us who can't be there are participating in Armchair BEA, a week-long virtual book blogging event that provides a little of the BEA fun for those living vicariously. I felt a renewed sense of community and energy for blogging when I participated in last year's Armchair BEA, and I'm excited to take part again. All this week, I'll be sharing themed posts and trying my best to visit other book blogs. 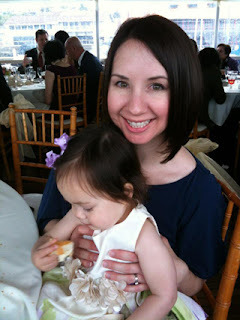 If you're visiting my blog for the first time, thanks for stopping by! I'm Allison, a teen services librarian in Southern California. I'm also a wife, and the mother of a 3.5 and 1.5 year old. I'm active in the Young Adult Library Services Association (YALSA), a division of the American Library Association. I'm currently the chair of YALSA's Conference Marketing and Local Arrangements Committee and I've just started blogging for The Hub, YALSA's YA literature blog. 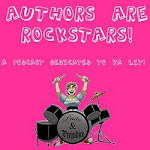 I also review books and apps for School Library Journal, and I co-host Authors are ROCKSTARS!, a YA literature podcast focused on author interviews. I've been blogging for about a year and a half. I got into it because I thought it would be a casual, fun extension of my professional life-- I am passionate about youth literature, and love connecting readers with the right book. Why not blog about it? Oh, but how could I not mention The Mighty Miss Malone, by Christopher Paul Curtis?? See..? Can't possibly choose just one. 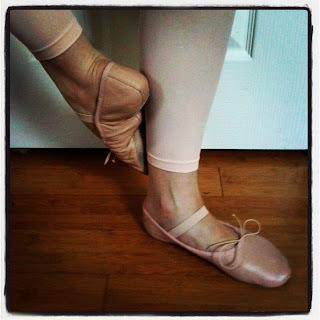 During last year's Armchair BEA, I was interviewed by the lovely Leah at Amused by Books, and I mentioned one non-book-related thing I was really hoping to do was take ballet classes. I've taken ballet on and off over the years, and thought it would be ultimate accomplishment to get back into it after having two kids. Not that I'm particularly good at ballet, mind you-- but I just love it. And I felt that taking ballet classes again would be like a sign that I have my life totally together. Well, I'm not sure if I have my life totally together, but I am proud to say that I've been taking ballet since January! So I must be doing all right. I'm definitely having fun, in any case! As a librarian who works extensively with the public, excellent service is very, very important to me. When I'm outside the library, I value being the recipient of good customer service, and Nordstrom is store that consistently provides me with positive experiences. I think libraries can emulate Nordstrom-style service to provide a welcoming atmosphere for our patrons. So I blogged about it! 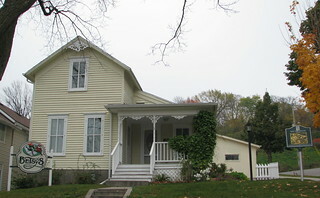 The Betsy-Tacy houses in Mankato, Minnesota! I've been fortunate enough to make pilgrimages to Green Gables and Louisa May Alcott's Orchard House, but I have yet to see the real life "Deep Valley" of Maud Hart Lovelace's Betsy-Tacy series, which are among my favorite books in the world. There's a Betsy-Tacy Convention in Mankato this summer, which would be great opportunity to finally see the houses. Alas, I won't be able to make it... but it's sure to be amazing! Thanks so much for reading my self-introduction. I'm looking forward to getting to know more of you in the book blogging community this week! your little one in pic with you is a real cutie pie! I love that you are so passionate about helping young readers find books they love. I taught middle school English for years and read to my own daughters from conception (yep, read to them in utero)...they all love to read, especially daughter #1! nice to meet you! I've always wanted to learn ballet! Great interview! Shadow and Bone is a book that I've been wanting to read for some time now. Allison - I had no idea there were actual Betsy and Tacy houses!! OK- this is going on the bucket list! I LOVED those books as a kid! Loved your intro! I just bought Shadow and Bone last night! Can't wait for it to get here so I can read it. I just checked In Honor out from my library, and I think it's going to be an amazing read. There's just something about working in a library, surrounded by all these great books, that makes me so happy! A charming blog. I enjoyed my visit! Hi Allison. You have just gained a new reader because I know I would love your blog. You're pretty much living the life I want in the future. I want to be a teen librarian and my boyfriend has been working in Santa Barbara so it's very possible I could end up there. I'll be back! I keep hearing good things about Shadow and Bone, I'm going to have to read it soon. Hope you have a wonderful week. I'm currently reading In Honor and I want to read Code Name Verity. It's so great to meet you!! Hope you have a great Armchair BEA week! Hi Allison! It's nice to meet you. This is my first armchair bea, and I can already tell that like you, I'm going to want to do it again. That's awesome that you're taking ballet classes. As someone who can't walk across a flat surface without tripping, I'm impressed. How funny that you refer to your literary excursions as pilgrimages! I tell my husband that I'll be making a pilgrimage to Prince Edward Island one day. Congratulations on the ballet lessons! I don't think I would be brave enough to stroll into a studio at my age, but then I've never had any kind of dance classes, and it definitely shows!